2. Cutting diameter size 1cm~25cm, up to 8 inch, 8-9CBM/H cutting capacity. 3. Discharge hood can rotate in 360 degrees. Easy swivel discharge chute. 4. 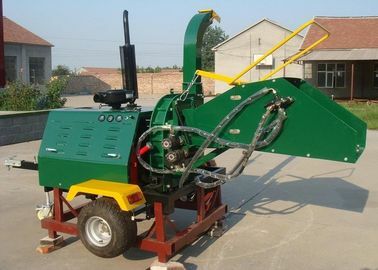 Feeding system: DH50 with double hydraulic motor feeding system. 5. 2 year warranty, heavy duty cast steel bearing housings. 3 blades, round disc housing, easy to change blades and belts. The small chips made by the wood chipper can be used for animal bedding, for the forestry and soil protecting, for new energy making, for compost and forcharcoal. Some customers use their colored garden waste chips, cover the soil and made the garden beautiful; some of them use the garden waste chips in the fireplace.